Free Session: The dear souls at Samsara will be providing one session on the 3rd Wednesday of each month through June 2019 with the possibility of additional classes becoming available. The instructor is being provided by Samsara Wellness with a grant from Kern County Mental Health and Behavior Board, which means it is no cost to participants! What a treat for body and soul! 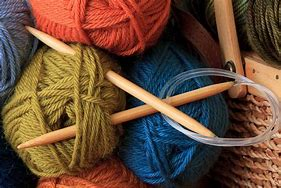 Come create and learn to knit with Lena Townley! A starter kit is provided for $10.00. Join your friends at CSL and get creative. Knitting is good for the brain, the soul, and physical dexterity. This class is opened to all who are eager to create something beautiful. No cost. Love offering accepted. Please reserve your starter kit in advance.